Business messages are text messages from companies you have subscribed to, sent through Viber. With business messages, you receive the information that is important to you directly into your app. Fun. Business messages from Viber are so much more than plain old text. Look out for messages from your favorite companies with images, links, videos and more. Secure. 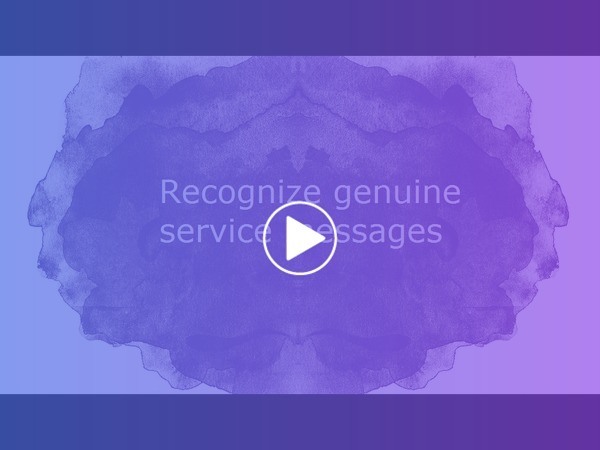 Business messages on Viber are protected by the same encryption as all other messages on Viber. Viber is committed to protecting you from scams. Look for the green check on a business message or the banner at the top of the message that says this is an official Viber business message. Keeping spam to the very minimum is important to us at Viber. In Viber version 7.7 we updated the opt-in process. The first time you receive a business message you will be asked to confirm again that you want to receive messages from this sender. If you do not agree, the sender will not be able to send you any more messages. If you don't want to receive business messages anymore, you can opt-out of them from your phone app only. Tap on Why did I receive this message? and choose Unsubscribe. If you do this, you won't receive this particular business message again. Open your Settings in the More screen, and tap on Calls and messages. Uncheck the box Receive Service Messages. If you do this, you won't receive any more business messages from any Viber partner until your turn it off again. All the business messages you receive go directly into a special folder on your chats screen, called the business inbox. This inbox appears in the chat list like any other message, but tap on it, and you'll see all your business messages in one place. Please note: The business inbox will only appear in your chats list when you receive your first business message. This inbox is only available on phone apps. * The Business Inbox is only available for users in Russia at present. Any messages you haven't read will be deleted after 30 days. With the business inbox you won't see a notification when you receive a business message. Instead, the business inbox will move to the top of your chats list, and the message badge will show the number of new messages. Delete messages in the inbox by swiping left (iPhone), or with a long tap on the message (Android). You can also choose to clear only one message or to clear the whole inbox. Move messages from the business inbox to your chats list. iPhone - swipe left on the message and choose Move. Android - long tap on the message and choose Move to main chats list. Move messages from the chats list to the business inbox. iPhone - swipe left on the message and choose Move and then Move to business chats. Android - long tap on the message and choose Move to business chats. If you choose to opt out of receiving business messages, you will be given the choice to delete your Business Inbox and any business messages inside it. When you uncheck the business messages option, a pop-up will appear asking you to confirm whether you want to delete the Business Inbox. Tap Delete to delete the inbox and all messages inside it. Tap Keep to keep a record of the business messages you received in the past.